Joining 130 other analysts, strategists, students, and friends and volunteers from Aimia, IVADO (Institute for Data Valorization), the PQDS, and other companies, Ron and I (representing T4G Analytics) spent two high energy days working through mountains of ones and zeros to find insights that could be useful for promoting cultural activities in the Quartier. We had at our fingertips data on more than 5.3 million PQDS transactions (8.8M tickets, 620k customers, and 20k shows) from about 24 different organizations, along with other associated information including social media, weather, and demographic data and – not to be underestimated – Alouettes home game dates, to try to understand influences on customer and purchase patterns. The group was divided into 10 different teams focusing on different aspects of the data, from offer performance (Ron’s team) to transactions and cross-selling (my team) to customer profiles. We’d had some time to brainstorm and prepare over conference calls the previous week, and after breakfast and some inspiring words from Aimia and PQDS event leads, it was time to dive in. 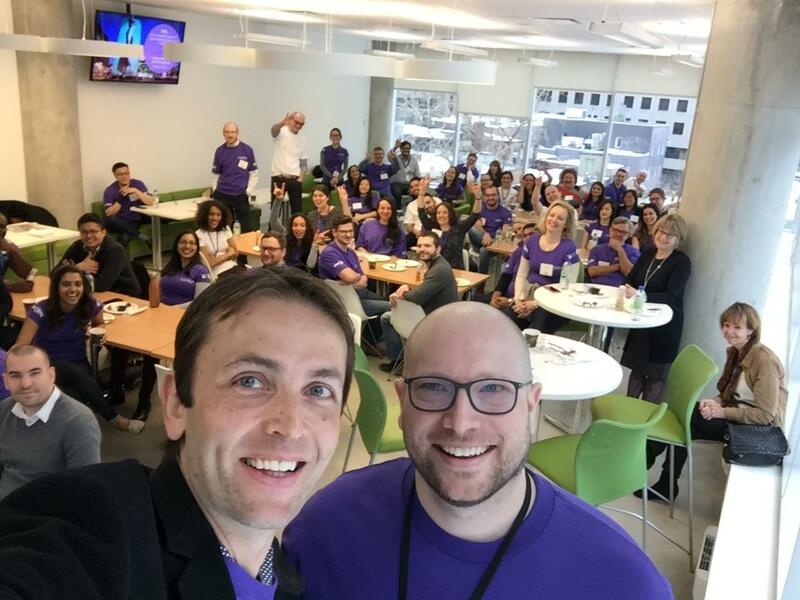 Fueled by a constant supply of coffee, fruit, cookies, and truly delicious meals (I ❤ Montreal), we set our sights on insights – those diamonds in the rough – that would be useful for the PQDS. The experience was both intense and wonderful. We’d begun at 8 am on Tuesday and, except for one 20-minute walk around 7 pm (necessary both for the espresso and the mental break it provided), I didn’t leave the building until after 11 pm – and I wasn’t even the last person standing. Most of that time was spent sitting around a table with other analysts and strategists, noses in our computers, creatively slicing, hacking, plotting, analyzing, interpreting, and building. It was amazing to collaborate with eight to 10 other people who were working through the same data as I was, all with our minds wrapped around the same concepts, information constantly coming in from other teams as we sent our ideas and questions out. We were able to quickly move through data-related decision making without time-intensive explanation, with questions posed and conclusions declared at a fast pace – data exclusion or inclusion, interpretation, and new fodder for exploration, all called out across the table and volleyed back and forth. Even with this arsenal of mental power, it wasn’t until a little after noon that someone said, “Ok, we have our dataset, now we can start looking for insights.” But from that point forward, everything was about finding insight from which the strategists on our team could shape useful suggestions for PQDS. Hours passed on a rollercoaster of excitement and frustration. (“Oh, wow, it’s 3 pm already.” “Do you guys want hourly time checks to know how much time you have left?” “No. Definitely not.”) Sometime mid-afternoon, the occasional exclamations of “I found an insight!” started. There were peals of keyboard clicking and heated conversations between analysts and strategists accompanied by whiteboard-scribbling, always with Wednesday morning’s PowerPoint deadline hovering. Eventually there was a transition to numbers and plots, ideas, and slides. We took a break to sleep, and then came back early the next morning, discovering things up to the last minute (and even afterward…). On Wednesday afternoon, we sighed with relief, closed up shop, and gathered with 200+ participants, PQDS members, and other analytics professionals to see all the groups’ presentations. It was an impressive display all around, with insights on things such as which demographic segments purchased which kinds of tickets, what sorts of events were attended by the same people (even a single attendee for metal shows and a musical), the times of day that people purchased different kinds of tickets, and whether ticket sales are depressed by snow (confirmed) or rain (busted). Insights were accompanied by strategic interpretation and suggestions for implementation. There was even a tool predicting ticket sales based on both controllable and external factors (including rain and those Alouettes games). Overall, the Data Philanthropy event was extremely successful and seemed to be a great experience for everyone, myself included. I find it immensely satisfying to dive into a jungle of data and begin to figure out the internal patterns to make it all make sense – like slowly pulling out a single long thread from an enormous tangle, or patiently bringing an image into focus. It was even more gratifying to be able to do this in the context of giving back to society. I am hoping I’ll have another opportunity to do so in my own community in the future! T4G was proud to join one of our newest partners, Aimia, in their annual Data Philanthropy event. 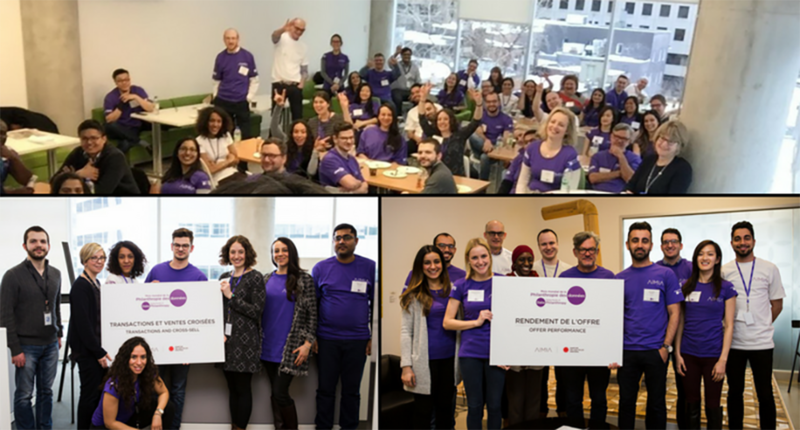 On March 21st and 22nd, we joined Aimia and other partners from across Canada in Montreal to bring the power of analytics to charitable causes. From a focus on improving their core missions and services, to optimizing communications and fundraising campaigns, data philanthropy provides charities with mission-critical expertise that may otherwise be cost-prohibitive and out of reach. This year’s Data Philanthropy team provided valuable insights to the Quartier des Spectacles Partnership (PQDS) – with data supplied by 19 organizations from the culture sector plus five other partners. This event is a key part of a contribution to Montreal’s 375th, in addition to the co-creation of a cross-sector (academic, social, and industry) hub in data science with the Institute for Data Valorization (IVADO). – Ed.